How much suffering and outrage will it take to change the terms of the immigration debate? The past week of tragic stories of family separations at our border—an inhumane and unnecessary method of deterrence freely chosen by the Trump administration—has begun to provide an answer. How much pain, cruelty and chaos is the administration willing to impose in order to appeal to President Trump’s base? At least as much pain as children wailing when they are taken from their parents. At least as much cruelty as parents being told their children are going to be bathed when they in fact are being taken away. At least as much chaos as 2,300 children taken from their families with no credible plan or apparent concern for reuniting them. How much moral and political opposition needs to be mounted until the administration finally admits—as it apparently has begun to with the signing of an executive order—that it has gone too far? At least as much as both the Catholic bishops and the Southern Baptist Convention denouncing family separations as immoral and unbiblical. At least as much as lawmakers from both parties calling clearly for a change in course. And for all this, not yet enough. Officials from the administration, with Mr. Trump personally leading the charge, have continued to describe their actions as mandated by law—a bald lie—in order to use the tragedy they have manufactured as leverage for their legislative demands. How much moral and political opposition needs to be mounted until the administration finally admits—as it apparently has begun to with the signing of an executive order—that it has gone too far? Moral and political pressure on the Trump administration must be maintained. Since launching his presidential campaign with racist slurs against Mexican immigrants, Mr. Trump has masterfully manipulated fear of immigrants to build his own power while eroding respect for their human dignity. Appealing to nativist sentiments seems to be his primary goal, even more than a border wall, which likely will not work. The executive order merely replaces the cruelty of family separation with the cruelty of family detention. 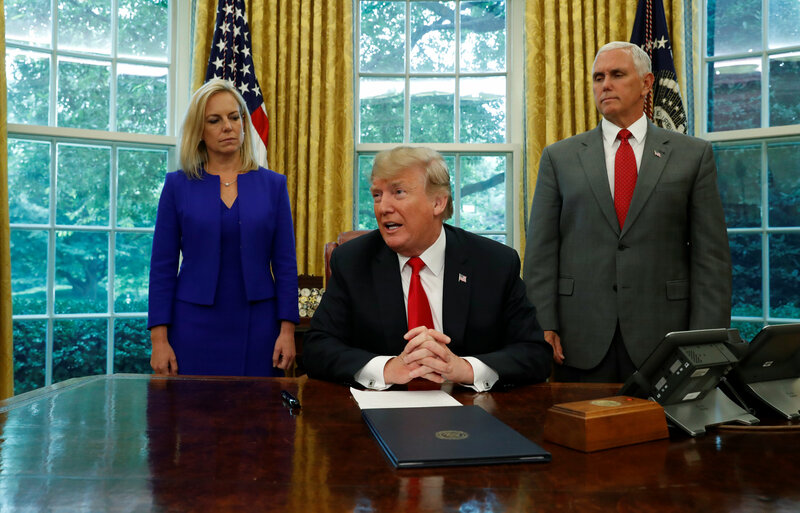 The cause of both policies is the Trump administration’s “zero-tolerance” policy to prosecute every person crossing into the United States without authorization. The fact is there is no humane or just way to enforce unjust laws. If the American people will not abide using children to threaten immigrants—or if even that threat proves insufficient balanced against the violence and poverty immigrants face in their home countries—what assault on human dignity will be next? It will not be enough to reject and repent of these extraordinary assaults on the integrity of the family unless the United States also reckons with the fact that our immigration policy needs radical change, not just better border security. While three-fifths of the country disapproves of Mr. Trump’s handling of immigration overall, and even greater numbers reject his family separation policy, a small majority of Republican voters support both. The United States is being held hostage to the immoral and unachievable political goals of immigration extremists who have rejected attempts at compromise. As a senator, Attorney General Jeff Sessions led the opposition that doomed the last serious congressional attempt at immigration reform, assisted by his communications director, Stephen Miller, who is now Mr. Trump’s domestic policy advisor and the chief architect of his immigration strategy. No progress on immigration can be achieved if the administration requires that the majority of the country simply capitulates to their demands. Border security, while necessary, is not an absolute good, as Catholic social teaching recognizes. Its pursuit must be balanced with the need for just methods of enforcement and even more with the basic right of people to migrate in order to sustain their own lives and those of their families. It is both a moral and a practical impossibility to seal our southern border, when life in the United States is so much safer than in the violence- and poverty-plagued countries the immigrants are fleeing. Any realizable proposal to secure the border must start by expanding, rather than reducing, the flow of legal, regulated immigration from Latin America to something commensurate with the actual demand. It must recognize the need to offer asylum to those fleeing not only political persecution but domestic abuse and gang violence. It must be the kind of comprehensive approach pursued by the Reagan administration during the last major successful reform in 1986, including a path to citizenship for the 11 million undocumented immigrants already peacefully living and working in the United States. Otherwise, the country will simply be priming the pump for the next crisis. In order to achieve anything better, the energy of opposition to the Trump administration’s family separation policy must be maintained past this immediate moment of crisis. The U.S. bishops have already criticized the new immigration bill proposed by the House Republican leadership along these lines. But in order to achieve anything better, the energy of opposition to the Trump administration’s family separation policy must be maintained past this immediate moment of crisis. The searing images of children being removed from their parents and held in cages in immigration detention centers have roused the conscience of the country. The consistent and explicit witness given by many religious leaders seems to have finally made it clear to the public that the God of the Bible stands unambiguously on the side of the “stranger in the land.” Catholics and all Americans should continue to press their political leaders to make their stand there as well and evaluate what direct actions they might be able to take, considering their unique circumstances and abilities, to aid those suffering because of these policies. The bishops should continue their prophetic leadership on this issue, including trips to the border and detention facilities. Officials working in the Trump administration and those responsible for carrying out policies designed to stoke fear of immigrants should carefully examine their consciences and discern whether their resignations would achieve more good than their continued work within the system. How much prayer and protest will it take to achieve a more just immigration policy for the United States? At least this much. For the sake of our brothers and sisters on our borders, we can do no less. How much prayer and protest will it take to achieve a more just immigration policy for the United States? What is the true story? Is the outrage a legitimate one? Obama put kids in football field sized cages and wrapped them in aluminum foil and no one said boo. The editors are advocating for open borders and the end of the United States as it has existed for the last 240 years. They should say that. What is the editor's immigration policy? I appreciate your consistent agreement with me. When someone responds with a comment to another and never addresses their issue, it is tantamount to agreeing especially when they imply the other person is inferior to themself. So thank you. Taught to me by Jesuits. This is about votes in an election and has nothing to do with children. I pray for all people of good will and reasonable conscience (not those who pray and discern over an issue and find, surprise, surprise, they're right yet once again!) who properly discern the desires of the Father in Heaven and to discuss solutions to this terrible issue. The problem is, this excludes at least some of the self serving bishops. We should be wary of the control of Rome as related to affairs of the world as this tends not to be from Christ but from man. After all, there is a huge difference in obedience to teachings of the Church on religious dogma and the current state of church as nothing more than another PAC readily using Christ and the faithful to leverage their demands. It is telling that the words "sophistry" and "casuistry" are so frequently linked to The word Jesuit. Hire a decent lawyer to read the Court Cases first hand. The equation is very simple: If the Federal Government enforces the law as written then the 9th Circuit in Flores vs Lynch states unequivocally that when the accompanying parent of a minor child is charged under the law then the minor must be"released"...viz separated.. without delay. Please note this particular case under the Flores Consent Decree was brought in 2015 against the Obama Administration to effectively close its Family Detention Centers and it was finalized by the 9th Circuit on July 5, 2016. You keeping quoting sources which fail to note that what followed the closing of those Obama family facilities was an Obama Policy of NOT enforcing the law as written by trying to create a civil deportation suits so that parent and child when caught illegally crossing the border would be "Caught and Released" to return for a hearing. Surely you have heard of that program, but apparently never knew how or why it was put in place. Less than 10% of those who were "caught and released" ever appeared for their deportation hearing! Your Editorial presentation is on its face intellectually dishonest in the extreme. It is compounded by references to pictures of kids behind chain link fences many of which were actually taken in 2014. Even then those pictures were unfair to the Obama Administration when taken because those facilities were the process and transfer facilities not permanent withholding facilities. Just where were the Editors in 2014-2016 when all of this last went down? The ACLU has already announced it will go to Court to overturn the Trump Executive Order. Federal Judge Dolly Gee and the 9th Circuit will once again have the last word on this matter and based on their Flores vs Lynch decision we will be back to same position very quickly. Your entire argument is based upon the predicate that the current immigration law is unjust. Fair enough. Change the law! But you cannot expect the people who were elected to enforce the law (and took an oath to enforce the law) to decide if they don't like a law or think it unjust that they simply won't enforce it!! That is exactly what you are proposing/demanding. The 9th Circuit in Flores vs Lynch took pains to point out that it's command to release minors was not a command to release the parents. It also took pains to state that this must be fixed by Congress. I recollect the old Jesuit advice at exam time "Pray like no amount of study will do, and study like no amount of prayer will do" The Editors seem to be very good at the "prayer side "of this equation but it's about time they tackle the "study side" with the same gusto.....And with some sense of intellectual honesty! The policy of catch and release is a de facto policy of open borders for people coming over the border. That people eligible to be deported will obey a court order to come before a judge after being let into the interior of country, is absurd. Trump got elected by people who felt they were being played by open border politicians implementing catch and release. People who believe that we should have a free flow of people from Central America and or Mexico, should be up front about this and try to legislate honestly for it. Now that Trump has pushed back on this catch and release policy, people who were good with it should now be calling for granting Permanent Protective Status to people from these Central American countries and or Mexico. Like we did for people fleeing Cuba's Castro . Or perhaps even advocating to make these Central American countries, territories, like we have Puerto Rico, so we could potentially effect the conditions on the ground fueling the violence, or calling for some treaty like exists in the EU that allows the free flow of people between countries, to work and to settle. The historical questions are never addressed. Why have so many Catholic cultures failed?....such that they are seeking a largely Protestant one...the usa? Chile is the only Latin American country that is considered “ developed” by the World Bank. Wherever Spain went...there you will find the chaos...including the Phillipines. Catholicism is avoiding this part of the refugee problem. Why did the Spain/ Catholicism nexus fail to produce successful countries? Surprisingly even Trump won’t confront the Church on these questions....but he is thinking it whenever the Popes chirps in with the Bishops on his cruelty. Isn’t it cruel to produce dysfunctional countries in the first place?....and then blame the later reaction like Trump against the chaos you took part in to some degree. Yes.....a Pope in 1454 began the dysfunction that became country after country south of us. Paul III opposed those four Popes in 1537 in these words.... “ notwithstanding whatever may have been or may be said to the contrary, the said Indians and all other people who may later be discovered by Christians, are by no means to be deprived of their liberty or the possession of their property,“...Sublimus Dei. But he did not put Portugal or Spain under interdict and withdrew the threat of that penalty under pressure. Often the Popes considered the financial retribution such countries could bring against the Church. The Protestant cultures are the capitalist imperialist powers that have exploited the third world. The Catholic countries do not have this Protestant work ethic that believe that if you are rich you must be good ,mindset. The Catholic countries have a more laid back joie de vivre cultures. Spain was functioning perfectly well but being badgered by the English pirates much like the Somalian pirates of recent years. Once Spain had enough, they set out to destroy England, and they would have if it hadn't been for a storm in the English channel that destroyed the Spanish Armada. England would be totally insignificant today but for that storm.Call that an act of God if you must. The Monroe doctrine kept Latin America dependent on us economically. They could have benefited from a little Napoleonesque intervention to end the European feudal system and bring liberal ideas of liberty and equality to Latin America. the monroe doctrine would not allow foreign interventions. Then there's supply and demand; americans are a nation of drug addicts. And where were the editors of America Magazine? I have lost count of the number of people here who are conflating two different situations. The Obama administration dealt with the influx of UNACCOMPANIED minors (mostly teenagers) by putting them in internment camps. That is VERY different from arresting people who are trying to gain asylum for themselves and their young children. That is VERY different from taking VERY young children, including babies, from their parents to an undisclosed location. It is brutal for the parents, but it is absolutely devastating for innocent young children whose emotional well-being is closely tied to being WITH their parents. They have no idea what is going on. They are terrified. It is a cruel policy to use innocent young children as weapons, as hostages to a dysfunctional political process with the aim being getting a multi-billion dollar wall that will do little or nothing to stop the entrance of drugs and criminals into this country. Sessions also decided to do away with the traditional grounds for seeking asylum - fleeing danger. That is the reason so many make the very hard trip north. THey are trying to protect their families against the violence in their home countries. They are people who are poor, and totally without power. They cannot just "change" the problems in their country. The best they can do is try to save their kids. So what happens - their chidlren - their babies and toddlers and young children are taken away from them, to God only knows where because most of the sites are not identified. They are being kept secret by this government. Many are trying to deflect from the evil that is being done by this administration. They are still looking to blame anyone but the person and the administration that is doing these things NOW - not two years ago, not four years ago, not ten years ago. It is THIS president and his administration and a spineless Congress that is inflicting cruelty and pain on innocent young kids. You may not think it right that parents tried to get their teenagers into the US illegally - to get them away from drug gangs who will literally execute them if they don't join up. The legal issues can be worked out. But there is a HUGE difference in how Obama acted with unaccompanied minors who were mostly teenagers, capable of understanding what was at stake, including the risk of arrest in the US, and taking babies and toddlers and young children away from parents who just want to try to get asylum. Instead of spending billions on an absurd wall that even most Republicans in Congress know will be a waste of money, why not spend some of those billions on dramatically increasing the numbers of judges empowered to judge asylum cases. The backlog is enormous. Why not expand the staffs at the consulates and embassies in countries that so many seek to escape, so that visa and asylum requests can be processed in an orderly and sensible manner, and reduce the wait times from years to months. Jesus gave some pretty clear instructions as to how we were to treat the stranger - welcome them and love them. Nothing about holding babies and toddlers hostage to Caesar's political goals. Your statement about the Obama Administration is misleading and wrong in its position that Accompanied Minors were not an issue. Once again you need to read Flores vs Lynch 9th Cir July 2016.......the precise issue was ACCOMPANIED MINORS BEING DETAINED WITH THEIR PARENTS IN FAMILY DETENTION CENTERS.. The Court specifically held that contrary to the Obama Administration position Accompanied Minors were covered by the Flores Settlement and could not be detained. The Obama Aministration was required to release the minors. You are absolutely correct that Congress must fix this....see again Flores vs Lynch which held that since Congress had not acted as the original Consent Decree required the Court would continue to enforce the terms of the Consent Decree and required the Obama Administration to separate the minors from their parents. If separating the children from their parents is the problem, then send the 10,000 children that have crossed without their parents be sent 'back' to their parents in the country that they came, so that they can be together as a family. And the other 2,000 children that came with their parents, can be sent back with their parents, to their own country. The separation problem is solved. America- The Jesuit review. So readers should know what this publication stands for. Is it based upon Catholic dogma, the truth, the word of God? Or is it a political organ, where the ends justify the means? Liberals are always beating the compassionate drum, but their hands are behind their backs and it is high time that the hypocrisy is exposed. America and Americans want to be a compassionate place and people, but we want to be as fair and as just as it is possible for human beings to be. Lawlessness is not a good platform on which to build anything and I suggest that "The Jesuit Review" should consider practicing some humility rather than trying to beat a dishonest drum. This editorial is pretty much on the money. The Catholic Bishops are right. The Southern Baptists are right. Ronald Reagan was right. George W. Bush was right. So sad to see so many thoroughly un-Christian responses here. If you aren't Christian, why do you come here? 1) This Editorial starts with a conclusion and then cherry picks and misstates fundamental facts to support that conclusion. 2) If you are going to reference political figures for support you might look up Bill Clinton in 1996 "We are aNation of Laws"; Hillary Clinton in 2014 on CNN "Just because your child crossed does not mean he gets to stay" ; Senator Barack Obama in December 2005 .."we simply cannot accept people to pour into the country unchecked .......etc etc". If you want a comparative picture of how Obama handled the border read the National Public Radio Summary by Scott Horsley August 2016...quoting the Migration Policy Institute on Obama's policy...."At the border there is a near Zero Tolerance system, where illegal immigrants are subject to formal removal and criminal charges." 3)You have no idea what any of the people you critique in these comments are doing to actively assist any of these illegal border crossers /asylum seekers through donations of either time or money. Ask yourself what you are doing for these immigrants (legal and illegal) other than nodding your head in agreement with the Editors.....then do more. "In April, 50,924 people were apprehended along the U.S.-Mexico border. Many were Central American families and children traveling without parents..." -this from the Washington Post. So now then, what is the Christian thing to do? And a response of "be Christian" or applaud the bishops is not acceptable. These are very real problems which requires very real solutions and not the standard mouthing of platitudes. The spirit of the editorial is, again, spot on. Saying clearly that I agree with Ronald Reagan and George W. Bush on immigration policy is concrete and definite. What is not acceptable, for me, is to not stand, forthrightly and unswervingly, with those who are being maligned as my grandparents and parents were maligned not so long ago. I cannot support any immigration 'policy' that is founded, in any way, on appeals to hatred and bigotry. I will not do it. I will oppose it with all my heart and soul, to my last breath. Not incidentally, trying, humbly and sincerely, to live by The Gospel, is far from platitudinous, thank ya kindly. I believe these words can apply everywhere, to all issues we face, especially this one. I try to apply them personally, if not perfectly, by being active politically, volunteering as well as voting, and by offering my time and energy to charities. Again, thank ya kindly. It is obviously perfectly fair for you to be be in favor of an "open borders policy" whether based on faith principles or otherwise. But your original comment unfairly asserted that every Christian must agree with you or be deemed unChristian. In this Article The Editors are being intellectually dishonest in their presentation of the governing law as it stands today. Their position is the same as yours: "Open Borders" or "Catch and Release" .....but like yourself they won't use those words..
To the extent that the law prohibits an "Open Border", Father Martin SJ (an Editor) in an another article simply declares that the laws creating preconditions for legal entry are unjust and need not be obeyed. In both cases you will note that the Editors simply dodge all references for what they stand FOR and only assert what they are against. They are know full well that an Open Borders policy is not acceptable to the vast majority of Americans and American Christians and therefore they cloud the issue. Similarly "Catch and Release" has been rejected by the voters in last election because it amounts to Open Borders ( the Released never appear for their hearing). My apologies to all if I was too harsh in characterizing some of the responses to this editorial as un-Christian. I'm sorry for being frustrated by the continued lowering of the level of our discourse to the point where I lowered myself. But if you're going to chide me for that, don't turn around and suggest that I'm dishonest about what I really believe. That's just flat out insulting, and goes against the admonition of the editors that we keep it charitable here. As for the editors, I think if they actually believed in 'Open Borders' I suspect they'd say so, and while I'd disagree with them, I'm pretty sure they'd ably profess and defend their views. While it looks like it's fun to chop away at their ankles with tiny little hatchets, they ain't dumb, and have some pretty weighty shoes, if you know what I mean. As for me. Don't insinuate, or say, that I am a liar. I don't believe in open borders. I don't believe Ronald Reagan did either, as I said. Pay attention, and respond to what people say instead of trying to tag them with strategic slander. What I said was that I'm sick and tired of extreme views hijacking seemingly every doggone issue we face. And I'm particu-larly angered when, again and again, the idea of us working to achieve something like bipartisan and comprehensive immigration reform is shot down by veiled and not so veiled ethnic, racial, and religious slander. There is no unassimalable horde poised to invade us as part of some nefarious plot to take down the Republic. That is a lie. A classic Big Lie, just like Harry Truman warned us of in another time when reactionaries were doing their best to muck up everything. How ironic, or not, that the likes of Roy Cohn would be seemingly reaching from beyond, through his avid mentee, to muck up things now. Lose this trump business and the attendant ugliness, come up with something that folks can debate respectfully, and then achieve a consensus on, and we'll all be better off. But keep making it win/lose, then it's a fight. You are absolutely correct that Congress must act to solve this problem. 2) The parent is charged and both the parent and child are detained together until conviction or release of the parent . 3) The parent is charged in a civil deportation procedure only.....the criminal portion of the statute is not enforced and both parent and child are released together to appear at a later date for the deportation hearing. In 2014 the Obama Administration adopted a Zero Tolerance Policy ( See Migration Policy Institute , " The Deportation Dilemma; Reconciling Tough and Humane Enforcement) In order to skirt the "separation problem posed by Option 1) above they set up three family detention centers to effectuate Option 2) above. But District Court Dolly Gee in 2015 and the 9th Circuit Court of Appeals in 2016 ( See Flores vs Lynch) declared Option 2) to be a violation of The Flores Consent Decree of 1997. Judge Gee at the District Court level recognized the enforcement dilemma problem and said that the parent must also be released! The Court of Appeals reversed that part of her decision and said the parent did not have to be released recognizing that to do otherwise would require them to determine that theStatute making border crossing illegal was unconstitutional. Not a tenable Court result! So the Obama Administration tried Option 3) under which the criminal law is not enforced and found that only 5-10% ever came back for their deportation hearing. So having been caught the offenders were simply released! Hence the phrase "Catch and Release" was applied....de facto "Open Border" if you cross with a child! Based on the law as it stands the choice now is Option 1) or Option 3). The Trump Executive Order by reassertion of Option2) is effectively requiring the Judge Gee and the 9th Circuit to either reverse themselves or to declare the Trump Executive Order a violation of Flores. Into this mess is the question of the perfectly legal right to seek Asylum under the law. But that right is not available under the law if you break the law. Illegal border crossing is such a breaking of the law. You must present yourself at designated border crossings to avail yourself of this Asylum law..
Father Martin' s article and the subject Editorial article both declare the border law as it stands to be "unjust" and therefore need not be followed. They do not call upon Congress to change the law...they call upon the Executive Branch to not enforce the law. That Jesuit position, by any description, is a declaration that the right to migrate at will is an inalienable right which cannot be abridged by law. ...a right to "open borders". Time to call Trump what he is. A Mussolini and Hitler revisited. Taking advantage of a white nation who feels threatened and preying on their fears. This is an immoral, totally narcissistic person leading our country. He is a demagogue who believes, like Hitler, that if you say it often enough people will believe it. This is the man who keeps a copy of Hitler's book on his night table. Horrific. Like Hitler, Mussolini, and Bonaparte he will have a bad ending. How many of us will be complicit in enabling him?? It is this kind of rhetoric, ad hominem arguments, that turn people away from your thoughts. You are playing the same game that politicians play which is the problem. Time to stop the polarization and ridiculous arguments, like calling Trump a Mussolini and Hilter. Both parties and past Presidents are responsible for the immigration mess. If you think 'open borders' are the answer, you are misleading yourself. I've thought about it. That's some pretty blunt language, Bill. But the only thing I'm a little cautious about, is I'm not entirely sure what the beast has on his night table to read currently, if he's reading anything at all. That said, I will say that I agree with you fully. I've felt since June of 2015 that this person is a monster who is evil and with virtually no conscience, or moral or ethical compass. His evil and the damage it can do to all of us, including the misguided and benighted who are signing off on his malignity and perfidy; this is the over-riding issue of our day. Thank you, paisan, for speaking the truth. THE JESUITS HAVE MORE TO WORRY ABOUT THAN DONALD TRUMP. THEY SHOULD BE LOOKING AT THE DESTRUCTION OF CATHOLIC EDUCATION BY COMMUNIST POWERS WHO HAVE NO GOD. ANTONIO GRAMSCHI TACTICS TAKING DOWN THE CHURCH SUCESSFULLY. THE GOLDEN AGE OF CATHOLICISM DIED IN THE 60'S. WE DID IT TO OURSELVES AND JESUITS ARE BAD EXAMPLES OF A RELIGIOUS SWORN TO GOD. 92% OF THE USA WAS CHRISTIAN IN THE 60'S NOW IT IS 68%. ALL THESE IMIGRANTS COMING INILLEGALLY COME FROM COMMUNIST COUNTRIES. YES THEY ARE CATHOLICS BUT THAT CAN EASILY BE REMOVED. WHEN A CARDINAL BLESSES A RESTUARANT FOR A FREE $600,00 MEAL THAT IS NOT TOO CATHOLIC. JESUITS STAY AWAY FROM THE COMMUNISTS. SPIRIT OF AMERICA PARTY RADIO SHOW. A careful study of history can certainly go a long way toward understanding the present, but it is useless to justify the present. The moral challenge concerns the next choice we make, not the last. Perhaps if America and the Left hadn't bashed Trump from the moment he was elected they'd have some integrity when there was a real miscarriage of justice. This did go on under Obama but nothing was said. Also, we know the Editors won't be happy until the borders are open. Have you written an Editorial calling on Congress to revise the immigration laws to achieve what you consider a "just law"? Have you contacted Senator Schumer to reprove him for refusing to allow the Democrats in the Senate vote on any immigration changes....Including a "clean bill" which addresses the issue of family separation directly without any other changes? Have you rebuked Senators Schumer and Gillibrand for refusing to cooperate in any fashion on fixing these issues? Have you actually read "Flores vs Lynch" , 9th Cir, July 2016 or are you still relying on third party sources for what it says.? No Court can order the Executive Branch not to enforce the law. The Executive Branch is not entitled to use "prosecutorial discretion" to exempt any class of people from the application of the immigration law -See Texas vs The United States, 5th Circuit, November 2015 striking down as unconstitutional The Obama Deferred Action For Parents of Americans order. TheExecutive Branch swears an oath to enforce the laws as written. Given these predicates! then EXACTLY WHAT DO THE EDITORS PROPOSE BE DONE under all of those circumstances? As an addendum: on Tuesday June 26, 2018 a District Ct ( Judge Sabraw) in the 9th Circuit ordered the Trump administration to keep the detained families together..... thereby making the Trump Executive Order the Court's own order! This should get interesting because that, at least facially, is a direct contradiction of the 9Th Circuit decision requiring children of detained parents to be released, viz "separated" ..See "Flores vs Lynch". The Trump Administration has now modified its recent submission to Judge Dolly Gee requesting modification of Flores to assert that she is now required to modify her original "separation order" of 2015 because this new decision by Judge Sabraw which compels family detention. The only "in between " these two positions is to order the Administration not to enforce the law. ...a position which will never survive final Appellate/Supreme Court review! I believe the Editors have already opined in this Editorial that Family Detention is unacceptable as "unjust" and yet a Judge has just ordered it!!!! "They grind exceeding small"... So what do the Editors propose as a solution? This article also appeared in print, under the headline "The Family Separation Crisis Reveals How Far We Are From A Just Immigration Policy," in the July 9, 2018 issue.